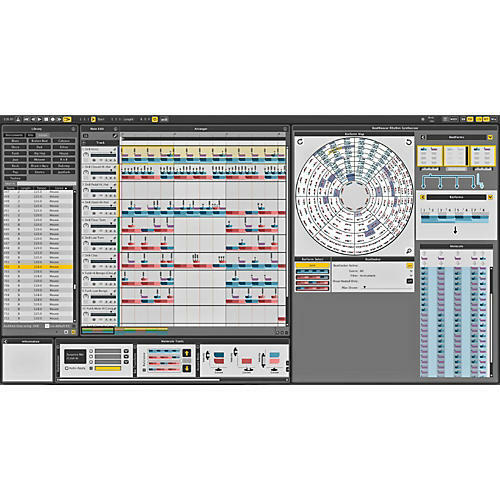 Powerful MIDI sequencing and editing tools. Liquid Rhythm is a fast and easy way to develop musical ideas by instantly inserting and swapping bar-long rhythm patterns onto individual tracks. By accessing Liquid Rhythm's vast library of patterns, loops and kits, you can quickly construct beat ideas and rhythmic patterns for fast musical inspiration. Liquid Rhythm also features a tight integration with Ableton Live 9 and Max for Live so you can import your MIDI patterns directly as Ableton Live Clips. This is the Intro Version of Liquid Rhythm and is the ideal choice for users who want straightforward and introductory tools to build rhythmic patterns. Adjust the velocity and groove of multiple notes simultaneously according to the Music Molecule's colour-coded accent patterns. Ditch the piano roll - now you can edit MIDI notes directly in the Arranger panel. Music Molecules are updated in real-time around your note edits. Start producing immediately with our library of percussive samples, drum kits, and loops, or import custom samples and download extra kits. Create and manipulate music like never before using WaveDNA's new revolutionary representation of MIDI. Integrate Liquid Rhythm directly into many different kinds of workflows by running it as a plugin or standalone. Quickly learn about features without leaving your Liquid Rhythm session. Stay in the zone! Order Liquid Rhythm today and add a spark of creativity to your next production. Mac: Intel machine running OS X 10.6.0 or later, and 2 GB RAM (recommended 4 GB). Java version 1.6 or better. 1GB hard disk space. Windows: Windows XP, Vista, Windows 7, or Windows 8 machine and 2 GB RAM (recommended 4 GB). Java version 1.6 or better. An ASIO-compatible sound card recommended for optimal audio performance. 1GB hard disk space. MaxForLive Clips plugin: Max 6.1.6. Note: When you update your version of Max, you must reinstall Liquid Rhythm for the Clips Max plugin to work. Please note that this is not a mobile application.